Height: 100 feet from keel to the highest point. We have trimmed the stacks and antennas to allow the required 40 feet of clearance from the surface. Trimmed sections were welded back to the deck to create more relief. Highest point is the kingpost at about 43 feet. Much of the superstructure, including tops of the bridge and and balloon hangar, antennas and stacks lies 40-60 feet below the surface. The main deck is at 80-95 feet. The keel rests at 143-150 feet. At 24.27 N, 81.44 W, between Western Sambo and Sand Key, and south of Hawks Channel marker #32. It is about 7 miles offshore. The site was carefully chosen ten years ago, with input from many interested parties. Permits from eighteen different agencies define the location. Over 130 dives were conducted to survey the site. It is on hard barren bottom with no coral and no submerged cultural resources (historic wrecks). How did they sink it? A model was constructed and multiple simulations were performed to design the sink plan. During final preparation at the dock in Key West holes were cut through the hull on each deck and at each compartment; interior bulkheads were also cut or removed and holes were cut through the decks. This allowed air to vent and water to enter evenly, for rapid precise siinking. 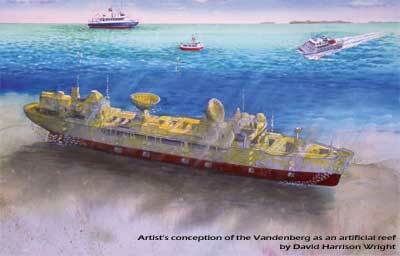 The ship was towed to the site and 5 8-ton anchors were deployed to precisely situate the ship on the selected site. Cutting charges opened 22 holes on each side below the waterline. Water pressure pushed the cut-out plates inward and water flowed in at the bottom as air was vented out the top. The ship has tons of ballast near the keel, which was placed there to create a stable platform for the big tracking antennas. It sank straight down, resting on its keel in less 1 minute 47 seconds. The location was within five feet and time within 7 seconds of the model's prediction.